Has the Calypso music called your name? Does the idea of studying medicine a stone’s throw from pristine beaches sound like a dream? Of course, choosing to study medicine in the Caribbean is much more complicated than just picking a location. If you want to add another option to your medical journey, make sure you choose from the right Caribbean medical schools. There are only four Caribbean schools that pass the extremely high standards of California’s Medical Board, which is a great way to narrow your search even if you don’t plan to practice in California. All four are approved for US government loan programs, for which you apply through FAFSA. We recommend focusing on the Big Four if you are considering medical school in the Caribbean. Residency: Over 760 residencies in the US in 2014. Admissions deadlines: Rolling. An interview offer can occur about two weeks after you submit your application and you can hear the final results within two weeks after your interview. Classes start in August and January. Curriculum: Like most island schools, students do their basic sciences in the Caribbean and then do their clinical work elsewhere. SGU’s clinical program is delivered at 70+ affiliated hospitals and clinical centers in the United States, Canada, Grenada, and the United Kingdom. Residency: A 93-95% match rate during initial residency match cycle. 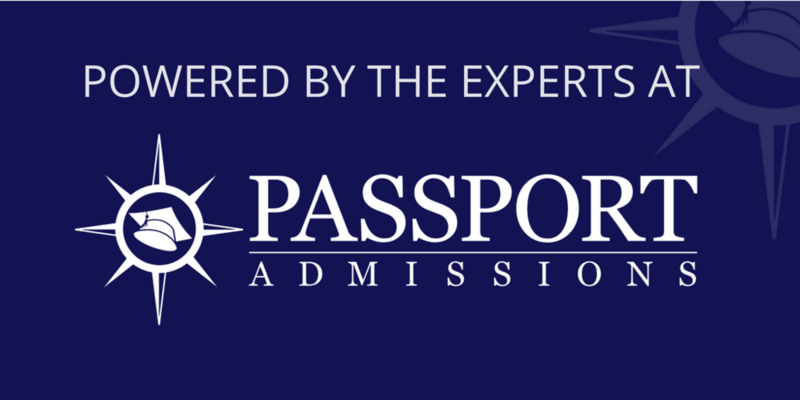 Admissions Deadlines: Rolling. Classes start in September, January or May. Curriculum: Ross offers an accelerated basic sciences curriculum (4 semesters) in addition to the regular one (5 semesters) on the island. After basic sciences, all students spend six weeks in Florida in a clinical foundations class. Semesters 6-10 are spent in hospitals in the United States. Board Pass Rates: A first-time pass rate of 97%. Residency: Over the last four years (2010-2013), the residency attainment rate for first-time, eligible graduates, who actively sought residency has averaged 87%. Admissions deadlines: Rolling. Classes start in September, January and May. 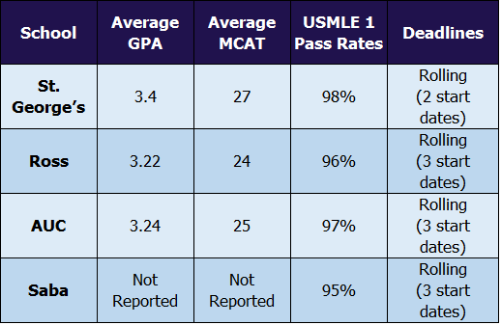 Curriculum: The first five semesters of basic sciences take place on the island, and then students undertake clinical rotations for 72 weeks in the U.S. and U.K.
Average GPA and MCAT: Saba does not publish these averages, but historically, they are lower than the other top four Caribbean schools. Admissions deadlines: Rolling. Classes start in September, January, or May. Curriculum: The first five semesters take place at Saba’s campus, but the clinical semesters (6-10) take place in hospitals in the United States.